I think I may have a new favorite....Wedding Sweet! Meaning, we all know that I love the Baroque Motifs stamp set, however, I really like the new Wedding Sweet stamp set and think it can be used for many occasions in many different colors. 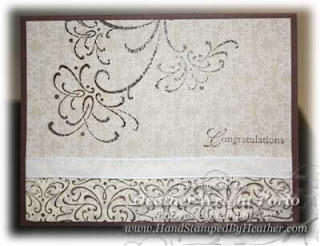 I recently create a wedding invitation sample set with this stamp set and below have a quick and easy wedding card. In creating this card, I used Chocolate Chip Craft Ink instead of Versa Mark to do the embossing. Ink the stamp in Chocolate Chip Craft Ink. Sprinkel with Clear Embossing Powder. I also used this technique with the wheel - roll in Chocolate Chip Craft Ink a few times to cover the entire wheel image, then roll on designer series paper and follow instructions above. Then assemble card and add ribbon and other desired embellishments. Lastly, I also really like the new Bella Bleu designer series paper and will soon be posting another project using Bella Bleu and an chipboard journal.